Rat in a Soda Bottle; Is It Even Possible? 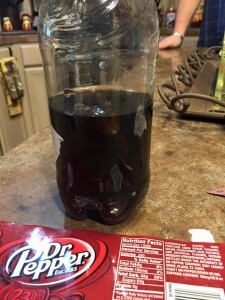 Perhaps you have seen the recent claims of one family in Texas who say that their 3 year told was drinking Dr. Pepper from a 2-liter bottle when he found a dead rat floating in the now half filled container. If this story about Dr. Mouse were true, it would be truly disgusting, but rest assured that it is not. First off, in case you haven’t already heard, sodas in general are fairly acidic. They have an average pH of about 2.5. Since most sodas sit in a warehouse, then in a truck, then in a distribution point, before being loaded on a truck and then possibly sitting in the back of the store for a few more days or even weeks, before reaching consumers, the time involved here could be several weeks between the time the soda was made and it arrived in the Texas store where it was purchased. As you can see from the photos, this is a complete rat. After floating in an acidic environment for this period of time, the only thing left should be mangled pieces; some fur, perhaps pieces of feet or teeth and bits of bone, but that’s about it. It simply isn’t possible for this intact rat to have floated in a bottle for this length of time and remain virtually untouched. Let’s also consider that Dr. Pepper is carbonated. This means most things will float. Even if the rat was so saturated that it sank to the bottom, the minute it was opened, it would have risen to the top. Another point to this story is that when you tip a 2 liter bottle to pour out the contents, the rat would have either blocked the opening or been seen at the bottom end of the bottle. 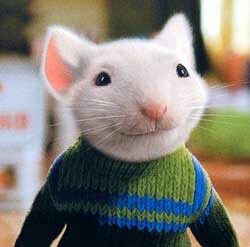 The family declined Dr. Pepper’s requests to return the bottle and the Stuart Little look alike to them so it could be tested. We can’t help but be reminded of a similar story of a man who said he found a dead mouse in his Pepsi. So while there is no denying that sodas in general are acidic, they aren’t, as you also might have heard, dangerous. While the extra calories won’t do your waistline any good, the acid level in sodas is only slightly more acidic than a glass of orange juice. Grape juice and cranberry juice actually have the same pH as a glass of Coke. When was the last time you heard someone complaining that grape juice (which also contains added sugar) was eating away at their intestines? The acid in your stomach is far more powerful than any soda on the market today. A very popular, but misleading meme making the rounds on social media sites claims that Coca-Cola can be used to clean toilets and remove rust stains. While this is true, the fact remains that orange juice can do the very same things. If you want to use something naturally acidic to clean your toilet, use plain seltzer water. 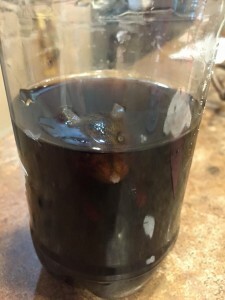 Coke and other sodas have a great deal of sticky syrup that you will have to remove. Plain soda water is also cheaper. That same meme says that Coke trucks need to have Hazardous Materials placards on them. This is true, but for the same reasons as mentioned above; sodas, including Coke, have citric acid and phosphoric acid, both of which, especially in large quantities, could be corrosive to metal if, say, the truck was involved in an accident. This doesn’t mean it’s the same thing as battery acid, which could kill you if you inhaled the fumes and will burn your skin within a minute. Stick your finger in a glass of soda, folks. We guarantee you, nothing will happen. When speaking about meme’s, it’s always good to keep in mind that many of them contain some small grains of truth, but they are blown way out of proportion. The rest of them are outright lies or they contain statements that are twisted to make the picture fit their paradigm. Don’t try to dupe corporation or others by putting dead animals in anything. Don’t be duped by those with something to sell you or an agenda to fulfill. Moderation is the key to life, friends. Enjoy everything in moderation, including moderation.